In light of the recent AFSCME strikes, the poor working conditions of many full-time UC workers have been brought to light. Yet, for many student workers as well, especially those employed by HDH, working conditions have been less than ideal. With the occurrence of the American Federation of County, State and Municipal Employees strikes in 2018, all attention was suddenly shifted to an area that has notably received very little before: the UC San Diego service sector. Oftentimes working jobs that cause them to slip further into the background, people in this line of work have dealt with the frustrating combination of being both overlooked and overworked. Not only have the strikes drawn attention to the plight of the UCSD service workers, but they’ve also thrust those student workers excluded from the general wave of strikes into the spotlight (as the strikes were mainly centered on full-time workers). 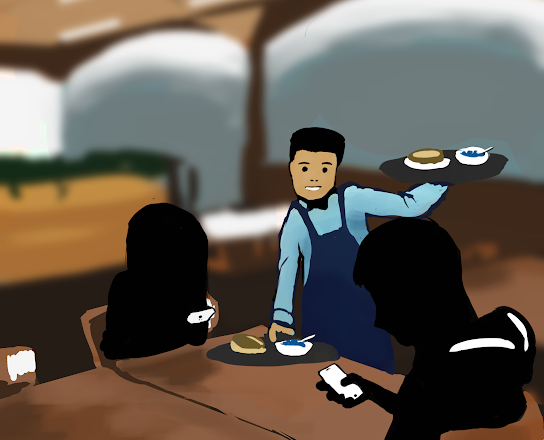 In fact, although these student workers do not work these jobs full time, it can be said that their working conditions are equally as poor as those of the full-time workers — specifically, for Housing Dining Hospitality workers. Waking up at around 6:30 a.m., HDH workers begin work earlier than most, preparing the dining halls for opening at 7:30 a.m. Once the food is prepared and set out, tables wiped down, cutlery and sauces restocked, and the workers set in place, the doors are opened to the onslaught of morning crowds who are continuously followed by the waves of lunch and dinner crowds that come in throughout the day. In periods when the crowds are more tempered, workers switch out the food for different meals. For the typical HDH worker, the days are filled with either the swelling crowds or the slow mind-numbing nothingness of staring at leftover food and slow-moving clocks. The day finally comes to an end a little after 9:00 p.m. when workers must stay afterward to clean up and throw away any extra food that may still be present by the day’s end. For market workers, closing time comes even later, when workers will begin locking doors around 1 a.m. This is all repeated the next day, and the next, and the next, and the next. In jobs such as these, it is easy for the work to begin to feel monotonous and meaningless. However, what dramatically intensifies the experience is the enormous scale that HDH operates on. Serving thousands of people each day while operating 14 dining halls and markets (not to mention the “housing” portion of their jobs), it is often difficult for HDH to keep up with the constant demands of students and faculty, all with a limited number of staff members. The fact that the number of staff members itself is continually fluctuating too — as turnover among HDH student jobs is high — does not help with the overall situation. Student workers are overworked and underpaid, and often have to compensate for the constant lack of staff. According to this anonymous worker, the understaffing problem is probably the most pervasive problem plaguing HDH workers. Because there is not much incentive to work the notorious HDH jobs (due to high stress levels and low pay), students who do work are coerced into working longer hours and more shifts. This leads to the overall exhaustion and mistreatment of current workers, which perpetuates the very ideas that drive students away from working at HDH in the first place, thus ensuring that the staff remains too small. In essence, the whole system is cyclical and in need of major reform. Jobs such as these, which drain workers of both physical and mental energy, as well as demand large amounts of time fail to compensate their workers properly. Not only are workers only paid minimum wage, but because of the stress, time, and energy that is put into these jobs, workers are often too exhausted to take on other responsibilities such as their schoolwork or involvement with different organizations. So where can reform begin? Perhaps one way would be to cut directly through the cycle and start with the treatment of its employees. Although they boast a good meal benefits program for their workers, HDH jobs are notorious for their harsh working conditions. Workers are often herded in and out of shifts quickly and are often forced to pick up longer shifts that go later into the night or begin earlier in the mornings. One worker even commented that no adult worker even seemed to remember her name, despite having worked there for around a year. Not only are workers treated poorly by their supervisors, but they are also mistreated by fellow students. In fact, it is oftentimes students who are the worst to the student workers, to the point of not even acknowledging their presence. In fact, to name a few, both HDH workers and Reddit users have mentioned that not only does HDH not recycle — despite having separate trash bins for recycling and trash and claiming that they do recycle — but there is also a lot of cross-contamination that comes from workers who do not change their gloves when handling food, as well as the fact that all leftover food is thrown away at the end of each day. Such instances can also be attributed to HDH’s enormity, and therefore, lack of attention to detail. Some students, outraged by these statements, have taken to calling for the privatization of UCSD’s dining system in order to create the healthy competition that would potentially lead to the better treatment of workers, higher quality food, and lower prices. Others have instead sought to appeal directly to HDH, whether this be in the form of protests or general complaints. This, in turn, has led to occurrences such as the HDH forum that took place last spring or the AFSCME strikes that happened recently (with workers fighting against racial disparities, outsourced labor, and for a pay raise). Yet, whatever method people choose to help reform the system, it is clear that all are fighting for a common goal. Change within HDH needs to happen, especially when it comes to its workers. This isn’t to say that HDH is not already working to improve. In fact, it is important to acknowledge the several positive changes have been made within different areas of HDH’s widespread realm. One of the more recent reforms was for the dining plan, which has received an overwhelming amount of criticism from students who complain that it is too expensive. Over the course of the next two years, HDH will begin lowering the prices of the dining hall plans as well as allowing for dining dollars to roll into fall quarter. However, when it comes to HDH working conditions, change is still a work in progress. Enter Pa Chia Vue, the Undergraduate Student Accounts Analyst for HDH. According to her, change is something that will take time. Yes, HDH is not perfect. Yes, it has a bad reputation when it comes to its treatment of workers. However, in order for improvements to be made, both HDH and its workers must be patient and continue to push for progress. These solutions, although seemingly here for a long time, will not come overnight and must be patiently awaited. As long as HDH continues to be receptive toward its customers and students and strives for change, it will move in the right direction. Hopefully, in light of the AFSCME strikes and with the focus now on the workers, more attention and pressure will be placed upon HDH for quicker and better solutions. I am a student manager for one of the busiest dining halls on campus and let me start off by saying, I am not a proponent of HDH. Yes, they employ me, and yes, what I am about to say may appear as though I am defending the company. But I know, firsthand, what they are culpable of, and how little the administration (those middle-aged men in their comfy offices NOT getting their shoes dirty in the Pines dishwater) actually cares about their student workers. However, I believe this “plight” is quite an exaggeration of what it’s like to be a student worker for HDH. Let me break it down for all of those who don’t know the in’s and out’s of what it’s like to work for one of the busiest dining halls on campus, and what we expect from our student workers. Full-time students who work for HDH are required to work a minimum of 12 hours a week. The majority of our shifts are ONLY three hours long. To keep it fair for every student worker, one of those shifts will be a closing shift (typically from 6pm-10:30pm or until their supervisor dismisses them; and in all three years of my employment, I have NEVER gotten out later than half an hour past that time.) One of those shifts may also be a weekend shift, but since we have limited hours during the weekends, not everyone ends up working a weekend shift. We do have shifts that begin at 6:30 am at only two of our stations. The rest of the stations have shifts beginning at 7am and 9:30am. So yes, sometimes our student workers will have to get up early and work a shift before class, and sometimes, they will have to come to work after class and work a closing shift. However, we make every single one of these facts known on two separate occasions before they even start working at their unit: once at their interview and once during their orientation, so that they have an accurate depiction of what they are getting themselves into. We also have some stations that are not as fun to work as others. It is commonly known throughout HDH student workers, with the exception of those that work at markets, that dishroom is the worst shift (yes, we even make memes about it on our student worker facebook page). You have to scrape food off of dirty dishes, you have to put away clean dishes, and because we have a dish machine that our administration refuses to replace, there is often puddles of water on the floor. However, we lay mats down to keep students from slipping, we provide gloves so they don’t get the gross food all over them, and we typically only schedule students one dishroom shift a week, and alternate which stations they work at, so that they don’t feel the “slow, mind-numbing nothingness” of working at the same place at the same time on the same days every week. As stated above, I concur with two truths presented in the original article. Sometimes, students will have to wake up early to work an early shift, and sometimes they will just have to go home smelling like dishwater. One point that holds no truth whatsoever, at least in my unit, is the so called “forced” “coercion” to pick up more shifts. Student workers (excluding student “lead shadows”, supervisors/”leads”, or student managers) are ONLY assigned four shifts a week. We understand that students pay tens of thousands of dollars to go here. Therefore, we treat them as students first, then workers second. Unfortunately, just like in the real world, that means your organizations and extra-curriculars come AFTER your employment. However, at my unit, I let my students know that as long as they let us know ahead of time, we will work with your extra-curriculars including, but not limited to, greek life, sports, internships, and second jobs. We do not ask that you sacrifice your entire life to work here. Just 12-15 hours a week (something we, again, let them know during their interview and orientation). I would also like to address the point that our students feel “poorly trained by their supervisors”. Our onboarding process goes like this: You are interviewed, you are given a job, you attend a now centralized orientation at the HDH administration building, you attend a unit-specific tour at your individual units, and you are trained at EACH and EVERY station BEFORE you work it. As an example, at my unit, you are assigned a three-hour training shift where one of our supervisors (who we call “leads”) will show you the ins and outs of the station you are training at, show you how to do things once, and then will watch as you do it the second time. We train our leads how to do this during their QUARTER-LONG training that they have to undergo before they earn the position as a student lead. They also ask if the student being trained has any questions, and checks up on them periodically throughout the shift. At the end of their shift, the leads write a log, which gets sent to student managers, full-time career managers, and other leads, detailing the experience of training the student worker. If the student manager (such as myself) reads that they did not get a hang of the station right away, we’ll schedule them for another training shift. Typically, a student does not need more than one training shift for each station, or at least that’s what they tell their leads. In summary, this picture that was painted of an evil, overworking, underpaying, corporation that profits off the backs of their student workers, is not actually so horrendous. Or at least if, after reading all of this, you still think it is, just know that these students were warned, on multiple occasions, of what to expect before officially starting work here. Now, I’m still a student worker myself. In quarters past, I have taken 22 units, participated on two sports teams, maintained my 19 manager hours per week, and worked in a lab, all concurrently. However, the difference between myself and some of the student workers that we hire, is that I understood what I was getting myself into. I knew from my interview and my orientation that it wasn’t going to be all unicorns and rainbows. However, I weighed the benefits (basically free food, on-campus location, flexible scheduling), with the negatives, and made the adult decision to work the job anyways. I spent one year as a student worker and worked my way up to one year as a student lead, and most recently worked up to a student manager. The job isn’t always fantastic, but it is a JOB, and unfortunately, a lot of the student workers that we hire do not understand what this means. Despite having the ability to work at 15 and a half years old, for a lot of the students we hire, this is their first job. We explain to them the work and attendance standards that we will be holding them to at orientation. Yet, somehow we still end up with at least 30 attendance infractions (including tardiness, calling out, or just not showing up) a week. We work with students, sometimes to the point of scheduling them BELOW minimum hours to 9 hours a week. Recently, we’ve done that with students who end up resigning anyways because they “cannot handle the workload”. We are constantly having to tell new hires the same information 3, 4, or 5 times. We are constantly having to have performance and attendance meetings with new hires, reminding them that this is a JOB and you can’t just not show up for three shifts in a row with no repercussions. So, high turnover rate? You betcha. In this year alone, we’ve had three students not even show up to their orientation, more not even show up to their first shift, at least ten saying “their academics were too overwhelming”, and more that didn’t even show up to the majority of their shifts in the first place. Maybe we should shift the focus just a little, and examine the work ethic of the typical student worker, and less of the ever-demanding, horrid monster that is HDH in its entirety. Not satisfied? I’ll give you another source to focus your blame: HDH administration. It is often idealized that heads of companies are middle-aged men in suits going golfing on the weekends and only popping their heads in to crunch down on the employees below them. In this case, you aren’t just a dizzy dreamer. In my three years as student manager, I’ve seen administrators a handful of times. The reasons that they decided to grace their meager student workers with their presence? To implement wild ideas and programs that didn’t work the first couple of times before, to chastise careers and career managers for not doing things perfect, and to hold hours-long meetings during our busiest of rush times. They are corrupt. Career Food Service Managers and Assistant Food Service Managers are bounced around, unit to unit, position to position, all because those who know the “good ol’ boys” of administration get placed in the more favorable units. For full-time employees that seek out positions of leadership, it’s all about who you know. And that means, units receive poorly-trained, underqualified career staff that couldn’t give a care in the world about the students that they are working with. If you want to place your blame on tyrants that treat their workers like garbage, do not give HDH as a whole a bad name. Make sure you call out each and every administrator going wine-tasting on the weekends, playing golf in the mornings, and coming in during our 1000-customer rushes just to tell us that we need to take our temperatures more often or follow our bland recipes more closely. Because every time us student managers, student liasons, or student leads have tried to reach out of them to advocate for our student workers that feel so mistreated, they have shot us down, or taken months to get back to us. Some of us students in leadership roles are part of this HDH monster you depicted too, so it’s about time we start putting the blame NOT on those that literally went through the exact same process that you did and understand what it’s like to be a student worker, but on those, at the top, that deserve it. And to the anonymous Pines student worker that felt so tired after their shift that they couldn’t even take a shower, we wish you would have reached out to your unit’s student manager. They could have worked with you, given you less hours, given you one of the two time off requests that student workers get every quarter, or simply just given you support. And we hope that all student workers feel this way. We are student workers too. If you are willing to put in the effort by showing up for work, taking in your training, and working with us, we can empathize and we can try our best to advocate for you.